Posted on January 11, 2019 by Kate L.
Maximus Decimus Meridus made Rome’s march to victory against the barbarians possible. He brought prosperity and glory to Rome and the Empire. Yet, the greatest General of the Roman Empire had not even set foot in this Xanadu once in his life. He was out on the battlefields when Commodus, the son of the Emperor, hid in the carriage. It was not because of Maximus’ bravery and excellence in war that earned him the trust of the man in purple, but it was his heart for the people that ‘persuaded” the emperor to give him Rome. He declined. All he ever wanted was to return to his family. He turned his back from this beautiful city, the fruit of his accomplishment. Fate seemed to detest a hero who did not follow the conventional path. No one would have thought Maximus would eventually enter the gates of Rome invited by vengeance. Sold as a slave who is “a father to a murdered son and a husband to a murdered wife, Maximus became a gladiator. Driven by intense grief and the desire for revenge, he fought his way to most grandeur fighting pit in all of history only to discover the truth about himself and Rome. The story of Maximus’ return of power to Rome is intertwined with trust and betrayal, hope and despair, as well as love and camaraderie. Rome is the light of the world, but it can be dimmed if misruled. Is Maximus truly the one to bring back and turn on this light? The ending is very sentimental (not going to spoil anything, just my personal feeling). But Maximus Decimus Meridus will be forever known by time as the general who became a slave, the slave who became a gladiator, and the gladiator who defied an emperor. There was a dream that was Rome. It was light. 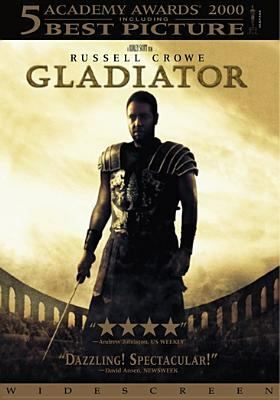 The film Gladiator is available for checkout from the Mission Viejo Library.